If you are a recording artist or a manager and have been distributing music on iTunes under a deal with one of the big record labels, pay attention. F.B.T. Productions in Detroit, the producers who helped Eminem achieve his success are paving the way via a lawsuit against Universal Music and others, to larger payouts for digital music sales via iTunes and other digital services both past and future. This effort could unleash literally billions of dollars in unpaid royalties for recording artists. 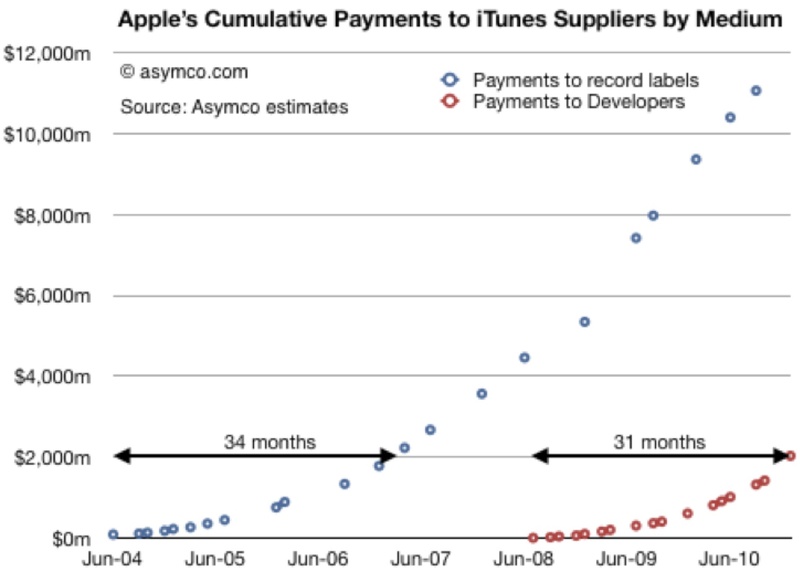 This chart from Asymco, shows the accumulated payments made to suppliers of content to the iTunes store over time. You can see that the total amounts paid to the record labels can be approximated at $12 billion dollars since the launch of iTunes through the first quarter of 2011. That would imply that the gross amounts collected by Apple are in the neighborhood of $17 billion dollars for iTunes music downloads. 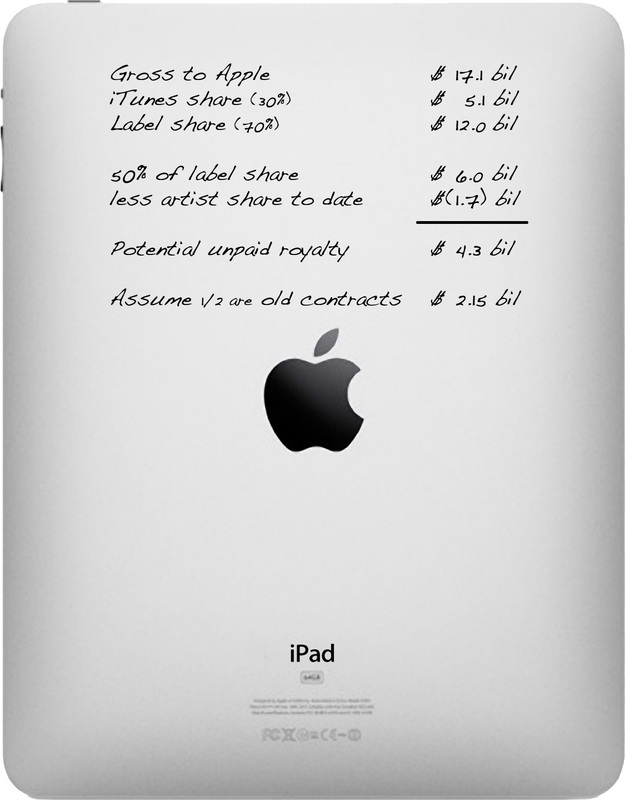 So I did a little back 'o the ole iPad calculation and here's what I came up with. I want to be realistic about the potential to collect and so will assume that half the music distributed on iTunes is from catalog sales of artists with older label contracts, and the other half is from music distributed from sales of newer artists. SoundScan numbers from last year show 648.5 million downloads of "catalog" singles in the US, meaning songs more than 18 months old, compared with 523 million for current tracks, so this seems like a very safe assumption. Using this quick and dirty math, the potential unpaid royalties to artists from just iTunes sales would be around $2.15 billion. Admittedly some of this money has already been paid to music publishers, so the number may be overstated somewhat, and could benefit from a finer accounting. But then again, catalog downloads from iTunes could be closer to 80% which would make the unpaid royalty number higher. So the amount is significant. Really significant. Are you with me? The lawsuit boils down to a distinction between selling "copies" of physical products such as CDs or vinyl recordings versus selling a "license" to reproduce the digital song data. Record labels actually ship physical product (principally CDs) to record stores; but in the case of iTunes it gets a license to replicate and distribute digital files. When the record labels sell "copies" of music, the artist typically receives a 10-15% royalty, but when the labels "license" the music to another entity, most artists typically receives a 50% royalty. The complaint filed by F.B.T states "Defendants have failed to comply with the terms of the March 9, 1998 agreement and the 2003 Agreement by failing to account and pay royalties equal to fifty percent (50%) of Defendants' net receipts from the digital uses of the Eminem Masters by the Music Download Providers and Mastertone Providers. Defendants apply an incorrect formula for calculating royalties with respect to those royalties to be paid to Plaintiffs which results in the payment of approximately twelve percent (12%) of receipts instead of the fifty percent (50%) required by the terms of the agreements." Universal Music Group, Aftermath Records and Interscope Records appealed against a ruling in the Ninth Circuit Court in December that said they should pay 50% of royalties on digital sales. The defendants took their appeal all the way to the Supreme Court. However, the US Supreme Court just last week rejected Universal Music's appeal in the case letting the Ninth Circuit Court of Appeals decision stand that digital music (under this particular agreement) should be treated as a license subject to a 50% royalty payment. Now to be fair, not all label agreements are the same, and if you signed a label deal in the last 10 years or so, you have probably been excluded from the impact of this decision by contract. Label attorneys have indicated that newer artists are unlikely to be affected by the decision because more recent recording contracts include digital distribution in the definition of "sales" for artist's royalty calculation purposes. But if you signed prior to the early 2000's, you may be looking at a significant payday. That apparently is the thinking by the estate of Rick James, which just filed a class action suit in April against Universal Music, opening the door for a massive settlement involving potentially thousands of artists. The filing can be found here. This is certainly not the last suit that we will see on this issue. For years I have been arguing that iTunes digital music distribution was a license of music, not a sale. When Steve Jobs and his team negotiated the original iTunes deal with the major labels, the economics gave iTunes roughly 30% of each download, like a distributor/ retailer of CDs would receive and the remaining 70% would flow to the labels and presumably be split as with a traditional CD sale. But what was rarely questioned at the time, was the way the 70% label share would be split. The labels assumed that these downloads were "sales" of copies of the songs and that artists would receive their royalties based on traditional accounting practices. Indeed in the early days of payments from iTunes, labels often continued to deduct fees for "packaging" and "breakage" and "co-op" often when there were no actual costs being incurred. Hardly anyone questioned whether iTunes downloads were "licenses" versus "sales" - which would have swung the payments heavily in favor of the artists. Steve Jobs himself referred to his deal with the labels as a "license" in his rare and open "Thoughts on Music" letter posted February 6, 2007. Interestingly, this letter has disappeared from and is no longer available on the apple.com web site but you can still find excerpts via Google. Hypebot reported that "Although he (Jobs) consistently referred to Apple 'licensing' music from 'the big four music companies', when deposed in this case he claimed not to know whether his company's relationship with Universal was, in fact, a license." This potential $2.15 billion represents approximately 12.5% of the gross revenue collected to date by Apple, and that 12.5% figure could apply to all the other digital distributors including Amazon, Napster, and others. With Apple's iTunes music revenue running around $300 million per month, that is another $37.5 million per month up for grabs at the present rates from Apple alone. This ruling has the potential to forever transform the very nature and structure of the recorded music business. Certainly all of the cloud-based systems like Amazon Cloud Player and those being contemplated by Google, Apple and others will be commissioned under licenses, especially when you consider that multiple instances of files will be available on a PC, mobile device or streaming. The very idea of copies just does not make any more sense in the digital age. This is a significant development for artists and the creative community. Artists and managers joined together could make it happen and see this incredible change of fortune through. This ruling will help transform the music industry for the better and redistribute the money in a way that is more sustainable. Certainly it will continue to be a painful transition, but finally there is some light at the end of the tunnel for creative people looking to sustain a career as a musician. And an indication of a better music business model for independent artists.